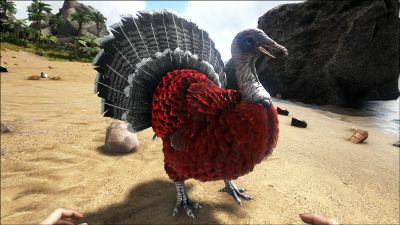 The Super Turkey is a wild bird that is only available during ARK: Turkey Trial. Harvesting Wishbone from turkeys allow players to craft a Chieftain Hat, "Turkey" Emote, or summon the DodoRex. Super Turkeys wander around aimlessly, similar to Dodos and often mixing with groups of them. 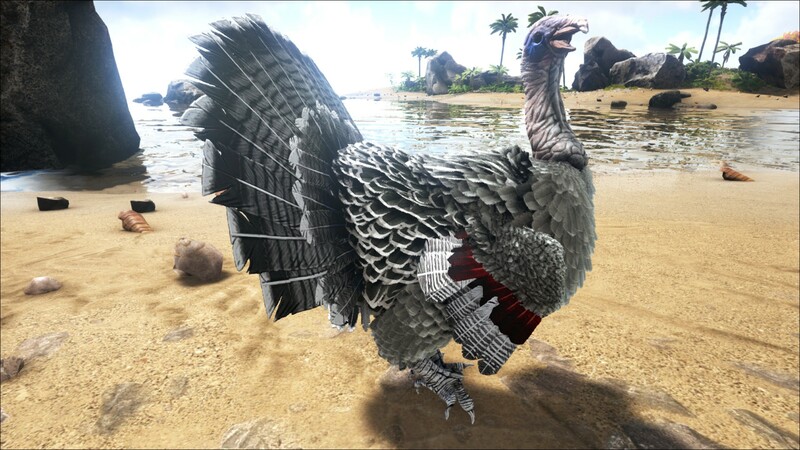 Attacking a Super Turkey will cause it to fight back, and any nearby wild creatures will attack or flee, depending on their temperament. Super Turkeys look like modern day turkeys, but are extremely powerful. Don't be fooled about their appearance! They can kill you easily! They have extremely high defense so make sure to bring extra help in the form of a flying creature, giga, or friends. Wing tips are not visible while the turkey is standing. This section displays the Super Turkey's natural colors and regions. For demonstration, the regions below are colored red over an albino Super Turkey. The colored squares shown underneath each region's description are the colors that the Super Turkey will randomly spawn with to provide an overall range of its natural color scheme. Hover your cursor over a color to display its name and ID. For example, "cheat SetTargetDinoColor 0 6" would color the Super Turkey's "main body" magenta. Note: The Wishbone can be obtained from the Turkey's death item cache on the ground where it dies if the corpse is harvested. Otherwise you can access its inventory in order to get it. 5The Super Turkey is incapable of drowning. The Turkey pecks at the target. This section describes how to fight against the Turkey. Super Turkeys hit hard, and take massively reduced damage from tamed creatures. All tames (with the exception of Giganotosaurus) are useless against it. However, tames may be useful for fending off the wildlife that automatically become aggressive when they are near an aggro'ed Turkey. If you don't have access to a Giganotosaurus, using firearms is one of the safest, and easiest methods available to kill a Super Turkey. If you have a Giganotosaurus use it. You can also use a mantis holding melee weapons. If you have neither, you can stand on top of any stone platform and use firearms, though it is possible using more primitive weapons such as the bow. Use firearms. If you are on Scorched Earth or Ragnarok, use fire arrows. The turkey will not stop pursuing you after you attack it. Chitin armor or better is recommended. If attacked, other damage-capable creatures will also attack you. The turkey cannot damage stone so you can attack it from on top of a stone pillar and render it incapable of damaging you. Or shoot it with a ranged weapon from a safe spot, e.g. from a Quetzal platform saddle. And although they are fast in water, they cannot attack while in water, allowing for you to either retreat or kite it and kill it without taking much damage (although its hard to hit due to its swim speed) If you are able to get one into the water the Dunkleosteus also seems to lack the damage debuff. Super Turkey takes heavily reduced damage from Dinos. Using human weapons or tools is recommended for an easier kill. Southern Islets spawn is specifically near the lower-south cave. Strangely enough, if the DoTame command is used, Super Turkeys can be tamed. Since DoTame normally only works on tameable animals, this might be a bug if it shares files or coding with the Dodo. During the first edition of Turkey Trial, turkeys were extremely slow and easily outrunned with base Movement Speed only. Unlike other event creatures on the ps4, the turkey is the only one the that does not exist within the code despite that none of them have been officially released.